NVIDIA is expected to pull the covers off its brand new lineup of GeForce GTX & RTX 20 series graphics cards later this month, which are said to deliver “breakthrough” performance. Although, some of the company’s add-in board partners have decided that you should not be made to wait any longer and have gone ahead and displayed their custom cooling designs for the new GeForce 20 series lineup. Picked up only by a handful of outlets and spotted by our friends over at videocardz, we have the first look at perhaps the earliest custom liquid cooled NVIDIA GeForce RTX 2080 graphics card, and this particular one is built by prolific NVIDIA AIB Colorful. 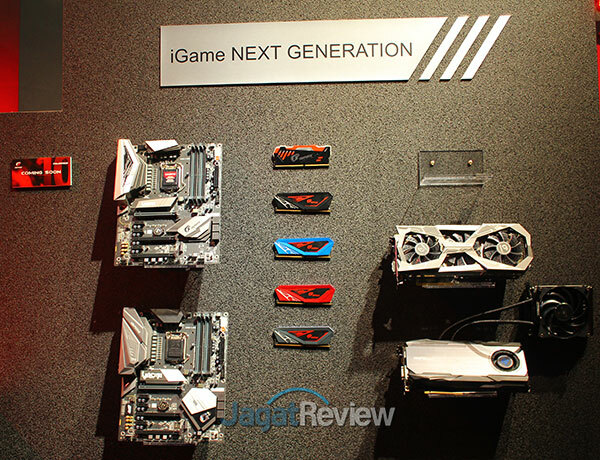 The add-in-board partner put on display its next generation iGame cooling solutions for the upcoming family of gaming graphics cards from NVIDIA. The triple fan air cooled design pictured in the right will make its way to the new 20 series GeForce family, however it leverages the same cooling solution from the current generation Pascal. The liquid cooling solution in the right lower corner on the other hand is brand new and has apparently flown under the radar. This card is said to be the brand new RTX 2080 iGame Poseidon. For its part, Colorful confirmed that this is indeed a brand new custom liquid cooled “next generation” graphics card from NVIDIA. Going by what some of NVIDIA’s AIBs have already said, you can expect custom cooled RTX 2080 graphics cards by September. Fear not however, as NVIDIA itself is said to be building a badass dual fan Founder’s Edition flagship RTX 2080 that would be made available at launch, so you won’t have to wait for custom cooled designs to grab a 2080 with proper cooling. NVIDIA’s next generation 20 series is expected to debut later this month, so stay tuned for more leaks about performance, pricing and more.